his intuitive inchtake-it-anywhere inch labeller is great for business owners and other professionals whose work environment is away from a desk or outside an office.The large, Vivid Bright graphical display allows labelling in most any environment. Fast print speeds and pre-designed labels support efficient labelling. Choose from a variety of fonts, symbols or frames to create custom, personalized labels even print barcodes.The large, keyboard-style layout enables easy and accurate typing, while the convenient, one-touch keys permit quick and easy label formatting and editing while on-the-go or standing. The PT-D600 is a versatile, PC-connectable label maker well-suited for a variety of labelling usages in a business environment. Quickly create professional-looking labels using the built-in keyboard, or connect to a computer to create more personalized labels. The intuitive, full-colour graphical display offers easy access to formatting menus as well as the ability to preview actual label appearance before printing. Just type, format and print. You can even save up to 99 labels in the large memory, a great time-saving feature. With its included AC power adapter and USB cable, you can be confident that your label maker will be ready when you are.The PT-D600 works with 5 different TZe tape widths - and the convenient, top-loading tape design lets you easily change tape cassette sizes and colours. Capture life's special moments in vibrant, beautiful colour and detail with the compact and easy-to-use EOS M100 interchangeable lens camera. These impressive results are simple to achieve thanks to the 24.2 Megapixel CMOS (APS-C) sensor along with features including a 3.0-inch tilt-type LCD that rotates 1800 for artistic angles and selfies, a Self Portrait Mode and Creative Assist to help guide you in getting the shot you want. On the video side, Full HD 60p and Dual Pixel CMOS AF let you record stunning and smooth action, while built-in Wi-Fi, NFC and Bluetooth technology lets you share it all, any way you like. 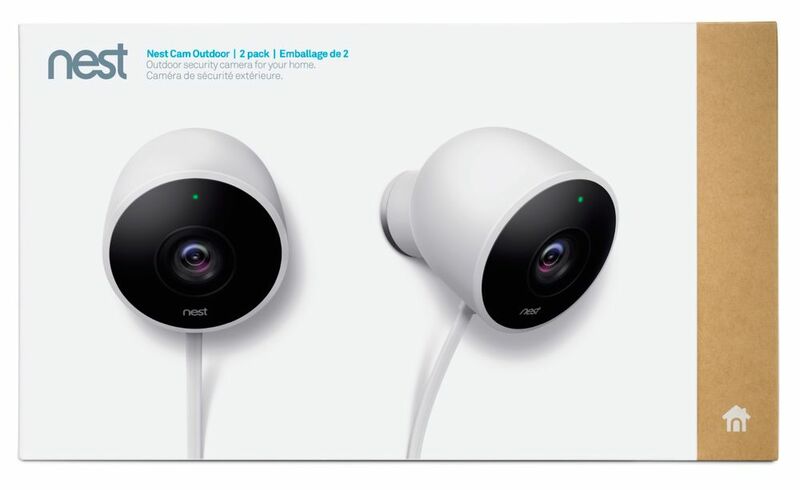 Cam Outdoor Security Camera White (2-Pack) Meet Nest Cam Outdoor. It stands watch 24/7, rain or shine. Plugs into power so you never have to worry about dead batteries. And sends an alert to your phone when it detects activity. It even lets you talk back through the Nest app. This is what an outdoor security camera should be. Cam Outdoor Security Camera White (2-Pack) is rated 4.9 out of 5 by 1601. Rated 5 out of 5 by EClarkewebb from Wonderful cameras! I recommend these cameras for ease of installation, video quality and dependability! They are a bit expensive but worth it!! Rated 5 out of 5 by Tutu from Love it Super simple set up. Reliable. Works great! Rated 4 out of 5 by OutdoorX from Great Quality, but design needs improvement The cable cord is visible, It's not as sharp at night as the indoor camera. You need to have a really good internet connection for the camera to work well. Rated 5 out of 5 by Tom63 from My Nest Cam Experience The effectiveness of this product is fabulous, and I would encourage its use to anyone, its ease of use, ease of setup, and ease of mind are self explanatory. I have owned it and have no regrets whatever, the pricing coupled with its effectiveness as a product are second to none. Rated 5 out of 5 by MFERGUSON from No complaints Surprised when my dad showed up with these for our cabin, very easy to install added the app to my phone up and running within 25mins. Picture/Video quality is amazing, love this product. Being mounted on a magnet, doesnt this make it easy to steal or at least knock it off? How will these cameras perform &ldquo;indoors&rdquo; since they are designed for outdoors. The 2 pack is of interest to me as there is a saving$ to be had there. These are rated to -20&deg;C but we, in Ottawa, regularly see temps well bellow this. Does anyone know if these work below -20&deg;C or if temps bellow -20&deg;C will void warranty?